The husband-and-wife design team of Charles and Ray Eames defied categorization. 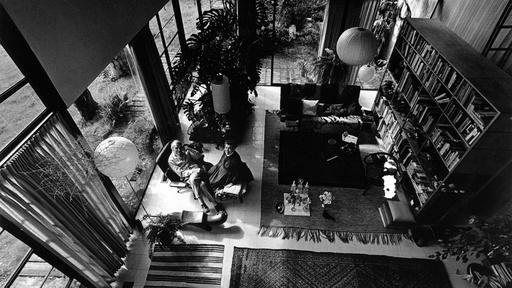 They were celebrated as architects, as filmmakers, and as furniture, graphic, and textile designers. Two things they brought to every project: a sense of curiosity and a commitment to "take your pleasure seriously." That philosophy helps explain the sensitive positioning of the Eames House on its Pacific Palisades hillside. The Eames had originally planned to place a bridge-like home across the meadow at the site's center. But when materials were delayed, they spent time picnicking in the meadow and realized that they would be obscuring the most delightful part of the site. So they reconsidered their plan and re-worked the home design, using the same materials. They placed the house where it could offer maximum pleasure with its view of the meadow sloping away from the house and the Pacific Ocean beyond. The home originated in response to a contest sponsored by Arts & Architecture magazine. Architects were challenged to approach residential buildings in new ways - using both new materials and new techniques - to accommodate the massive need for housing after World War II. The homes were meant to be practical, affordable, and reproducible, "using as far as is practicable, many war-born techniques and materials best suited to the expression of man's life in the modern world." One of the homes commissioned as a result of that challenge, the Eames House is constructed of prefabricated parts and materials that could be easily and quickly assembled on site. And though it is prefab and industrial, the home achieved a highly personal and individual aesthetic, thanks to the Eames' design sensibility and their collections of interesting objects. When Arts & Architecture magazine published the completed Eames House, it couldn't help but gush: "We think it is a beautiful job, sensibly and intelligently conceived." Explore the official Eames Foundation site. 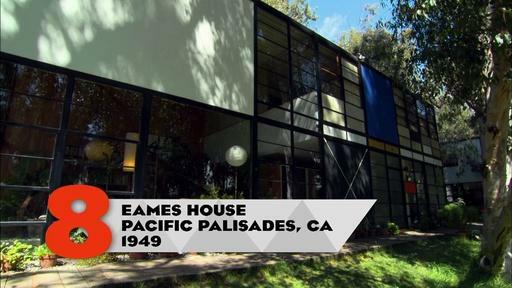 Learn about Charles and Ray Eames. Plan a visit to the Eames House. The Eames House responded to the need to approach residential buildings in new ways after World War II, creating a fresh living space from readily available building materials.